Newfoundland dog history begins on the island of Newfoundland off the East coast of Canada. This is a very ancient breed, which very likely originated in the region with the Vikings. There is archaelogical evidence of the dog going back as far as the Vikings, and some theories involve outcrossing with the now extinct black wolf. What is clear is that the larger dog we have today evolved from the smaller St John Dog, who had a similar purpose. The first time we see the name Newfoundland written in relation to a dog is in 1775, when sportsman and diarist, George Cartwright, gave the name of the island to his own dog. In 1780 the Commodore-Governor of Newfoundland limited the ownership of the dog to one per household in some vain effort to promote sheep rearing, though I personally see little connection. It did nothing for sheep rearing, but did result in the breed almost becoming extinct. Breed enthusiasts thankfully broke this law and continued to breed. 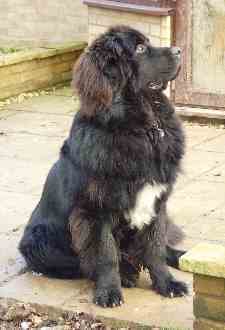 In the eighteenth century the Newfoundland started to appear in literature such as Charlotte Bronte's Jane Eyre. Records from 1824 indicate that there were 2000 of these dogs living and working on the island, pulling milk carts and hauling loads. The dog has evolved with webbed feet. They are natural swimmers and have been famous for grabbing onto the ropes of sinking ships and hauling them back to shore. They have a natural instinct to rescue, and if they see anyone in distress in the water, they are likely to dive in, grab their arm and swim them to safety. They have also been known to dig people out of snowdrifts.